1. Identify locations and neighborhoods you’re interested in. 2. Create a home checklist of features that you want. 3. Post where and what you’re looking for, with your profile. 4. Share your post and where you’re looking on Facebook. 5. Decide together whether to employ an agent or continue privately. Buying and selling owner to owner homes is gaining in popularity as digital innovation in real estate. RuListing offers more and better information for buyers and sellers to make their own decisions and manage real estate on their own. Buyers have many online resources now to find their own home, without an agent. 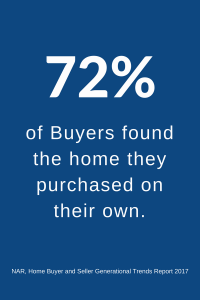 In fact, according to the NAR, Home Buyer and Seller Generational Trends Report 2017, buyers are doing just that with a reported 72% of buyers finding the home they actually purchased. With that statistic in mind, it’s wonder buyers are looking to connect themselves directly with homeowners. The answer to how to buy and sell owner to real estate centres on the home buying process and the steps homebuyers can take to contact owners privately without an agent. Step 1. Identify locations and neighborhoods you’re interested in. There are many online resources to do your homework before getting in the car. You can search information on specific neighborhoods including local real estate values, schools and demographics on Neighborhoodscout.com for example. Go to Google Streetview to explore streets within your sought-after neighborhoods looking for proximity to undesirables including power lines, freeways, commercial or industrial traffic. 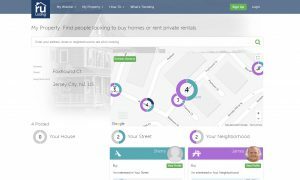 Store your favourite neighborhoods and addresses on a free House Hunting tool, such as RuListing.com‘s Wishlist, mapping and pinning all entries in one place. Take your house hunting outside and spend time driving within your sought-after neighborhood, searching for ideal streets or dream properties to add to your Wishlist. Take photos and record notes of features and attributes you like and don’t like to each location. Step 2. Create a home checklist of features that you want. When buying owner to owner homes, you’re no longer restricted to buying from the inventory of homes listed for sale on MLS, and compromising on your must-haves. Genworth offers a house hunting checklist to keep you focused and organized. Use this tool before open-housing as it’s easy to be marvelled by great interior designs that turn into your must-haves. Step 3. Post where and what you’re looking for, with your profile. As you’ve mapped and saved the preferred address, streets and your sought-after neighborhoods, the next step is to post it on a free website, such as RuListing.com to advertise where and what you’re looking for. Create a profile of who you are, adding as much information about yourself, including uploading your social profiles, for owners to view before sending you a private message. A completed profile lets owners know a bit about you, including any mutual friends or how you’re connected together, and that you’re a serious buyer, not just a tire-kicker. Step 4. Share your post and where you’re looking on Facebook. Engaging your network of family and friends by sharing your post on Facebook is one of the quickest ways to buy owner to owner homes. Often you may be looking to buy closer to someone in your network, who knows of a neighbor who may be considering selling. Sharing your post gives your friends a shareable link to their neighbors and network to view your profile and contact you privately. You can also mail letters inviting homeowners to respond to your post. Spreading the word that you’ve post where and what you’re looking for with your profile, is important to be successful in receiving a private message from an owner and in buying and selling owner to owner homes. Mail letters to homeowners within your posted neighborhood, to invite them to view and send a message to let you know if they’re interested in selling in the future. You can download a letter for free on RuListing.com. Step 5. Decide together whether to employ an agent or try the Owner to Owner Real Estate path. Discuss and agree on how to move forward together before meeting in person. When considering the path of buying from a For Sale By Owner property, understand that sales process well, here you can get more tips and myth busters to be aware of before you go down the path of for sale by owner. HGTV published a great guide for sale by owner helping you through the process of private real estate, buying and selling owner to owner private real estate. Connecting Buyers and Sellers using digital innovation in real estate will change the purchasing process just as digital has changed many of our other processes. 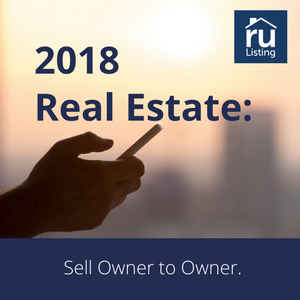 Learn more about how to sell owner to owner in 2018. If you’re interested in contacting buyers? Sign up for RuListing.com for free. 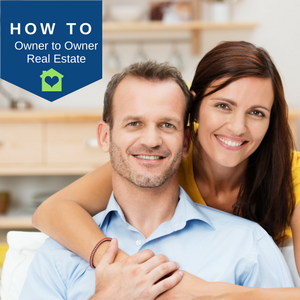 How to Steps to Take with Owner to Owner Homes, Private Real Estate 1. Identify locations and neighbourhoods you’re interested in. 2. Create a home checklist of features that you want. 3. Post where and what you’re looking for, with your profile. 4. Share your post and where you’re looking on Facebook. 5. Decide together whether to employ an agent or continue privately.